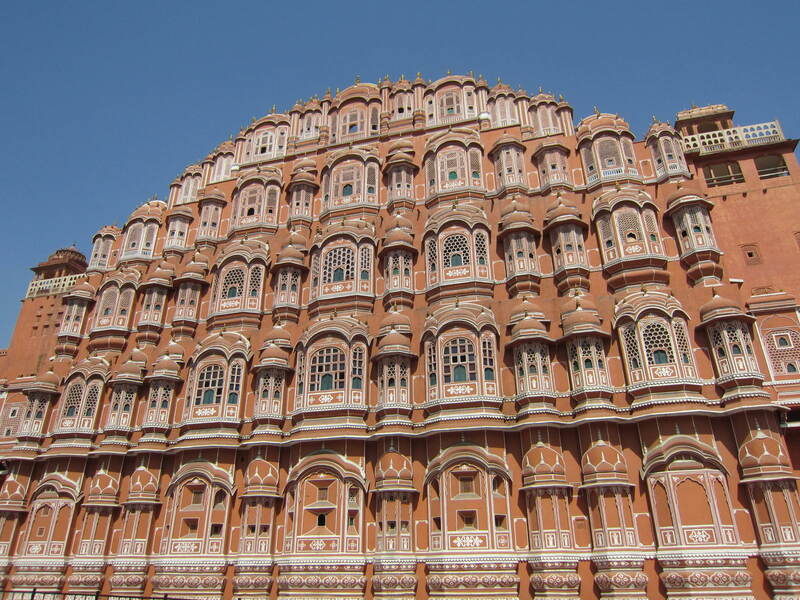 Jaipur, named the Pink City, for the salmon hued outer wall of the old city, is by far my favorite city in India. The old city center is a shopper’s haven, filled with streets lined with shops brimming with handmade delights. Head straight to “Badi Chaupar”, one of the central shopping streets. It’s a good point from which to branch out and discover the small side streets. Jaipur is known for its jewelry. 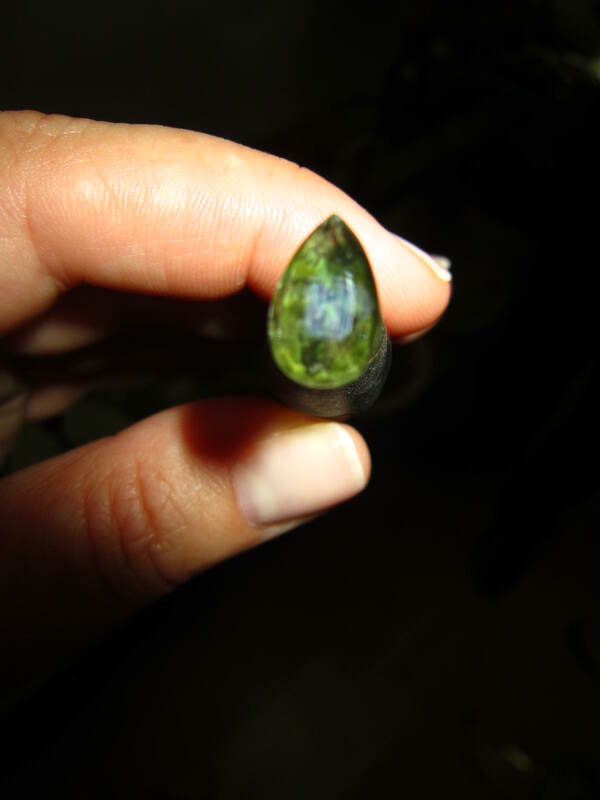 It is the hub for cutting raw stones, like emeralds and sapphires and setting them in beautiful, intricate designs. 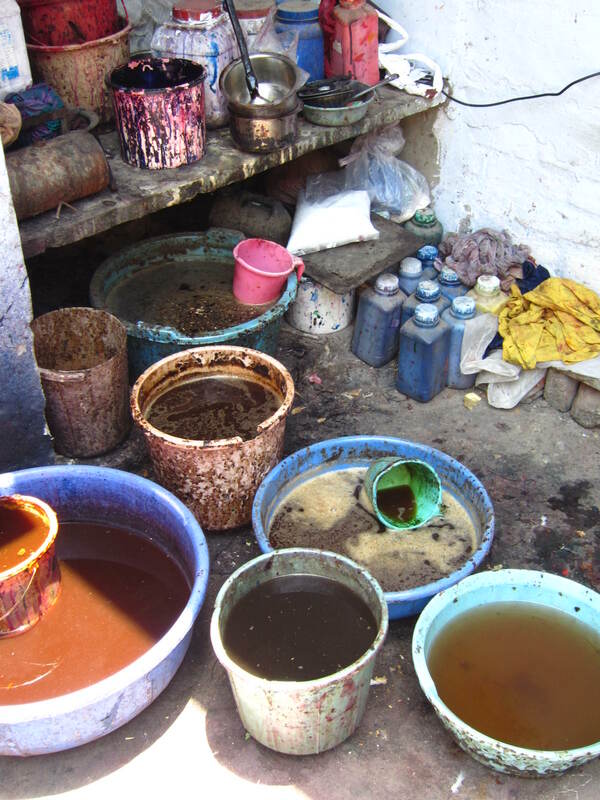 I was able to see this process first hand, which made me appreciate the work that goes into each piece of jewelry. You can easily find a wide variety of modern and traditional Indian settings. These shops are usually located away from the hustle and bustle of the city center, allowing for an air-conditioned, calm shopping environment. These shops take credit cards and some bargaining can be done but reserve your intense bargaining skills for the shopkeepers in the market. Cut stone in a temporary setting, ready for polishing. Handmade Lakh bangles made from tree resin and decorated with rhinestones are produced locally as well. 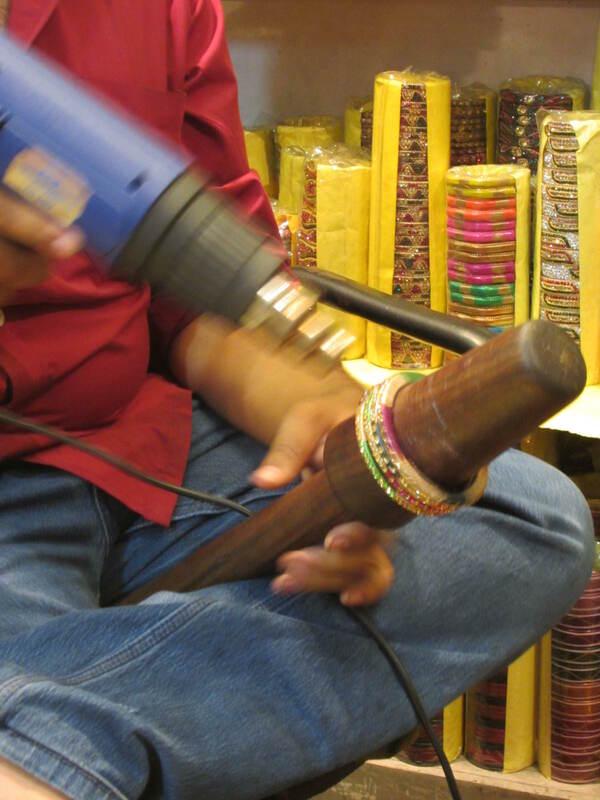 Bangle shops are one of my favorite places to visit in India. There are endless color combinations and designs to choose from. Traditionally, they are sold in sets of 4 or 8 pieces, though I tended to buy larger sets, enthralled by the sheer amount of variety available. “Maniharon-Ka-Rasta” is a street in Jaipur with multiple bangles shops. I recommend going there during the day as we ended up there around 8pm and many of the shops were already closed. 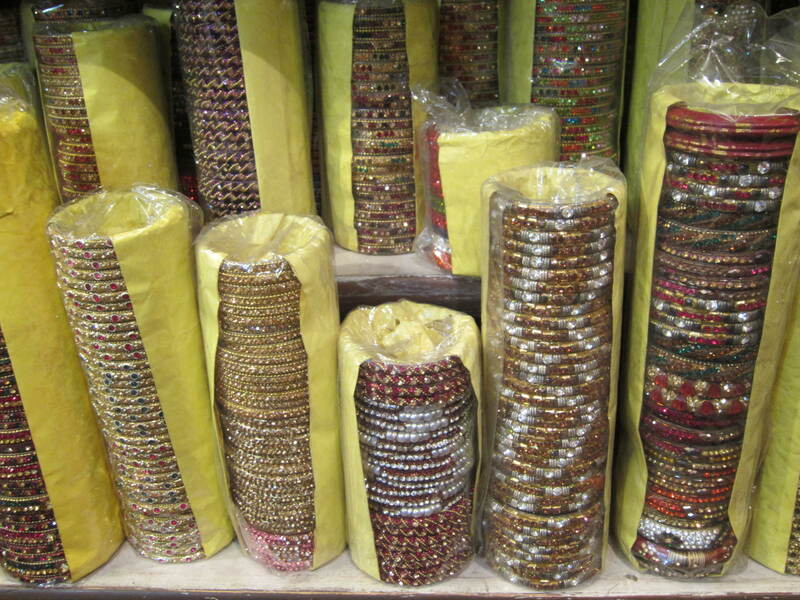 The material used to make Lakh bangles allows it to be heated and stretched, which can be done in the shops, if you need a bigger size. I have a lot Lakh jewelry pieces (necklaces, earrings and bracelets) and I must share that the bangles are the most delicate of all my pieces. They are fragile and can break quite easily. I would not discourage you from buying them but I did purchase many other bangles in India (metal bases with decoration, rather than the Lakh) and they are much more durable. Bangles being heated and stretched. These are the bangles I bought. 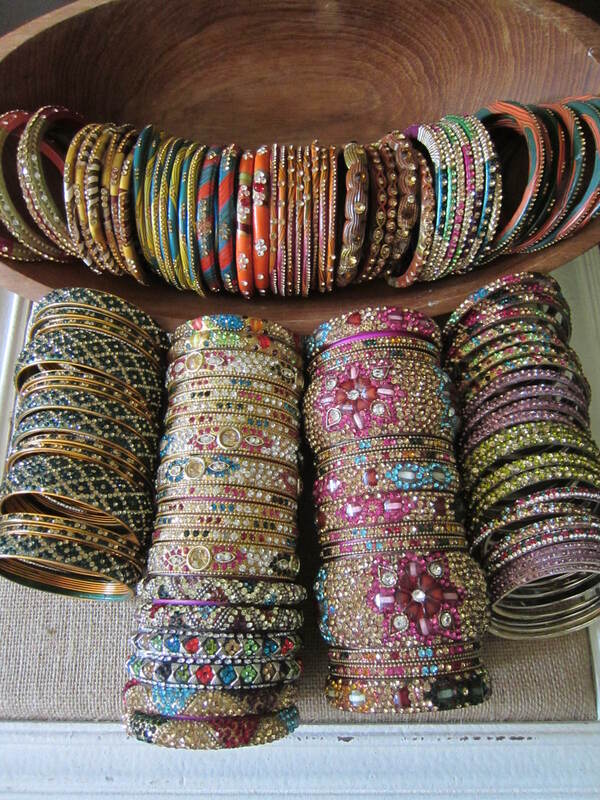 The top row are all Lakh bangles and the others are metal bangles I bought in Hyderabad. 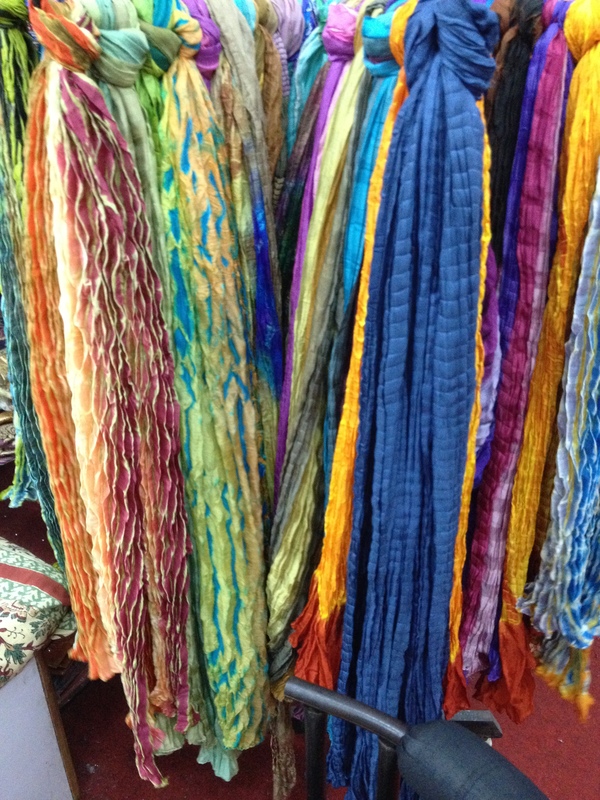 The variety of handcrafted items continues in Jaipur’s textile shops. 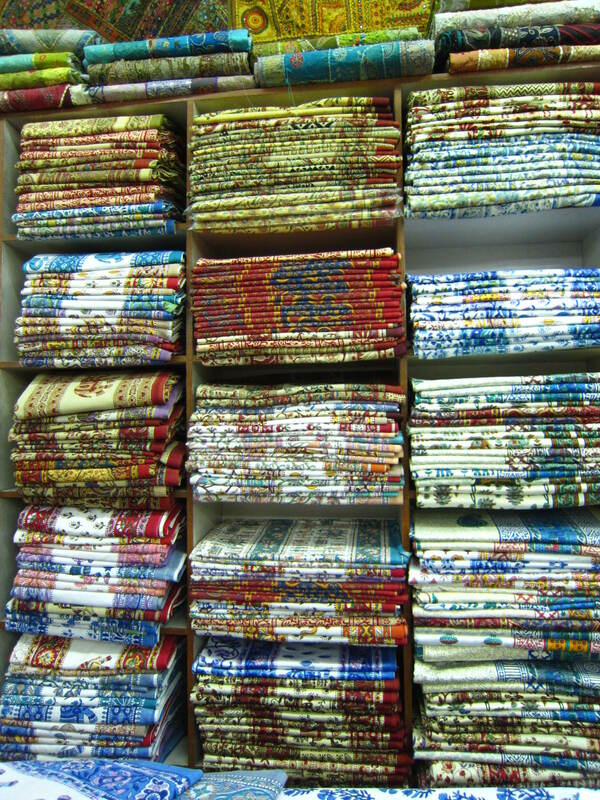 There are a vast array of closet sized shops selling clothing, leather slippers, scarves and textiles, all of varying degree of quality. The shops on the street are bustling, with shopkeepers trying to lure you into their shops with a bargain. 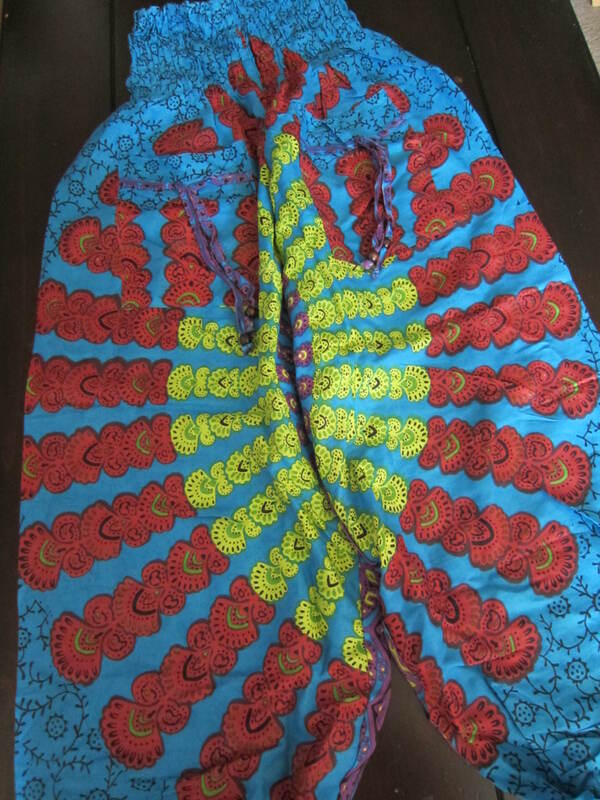 I did buy some lightweight harem pants in various colors and patterns to wear while I was there, in the extreme heat of India. I was able to negotiate a better deal by buying a dozen pairs at a time. That may seem like a lot but they made great gifts for folks back home. I am all for a game of haggling, but when the heat is oppressive and you just want slow down a bit, I recommend visiting one the larger stores, off of the main drag, where you can shop a bit more peacefully. 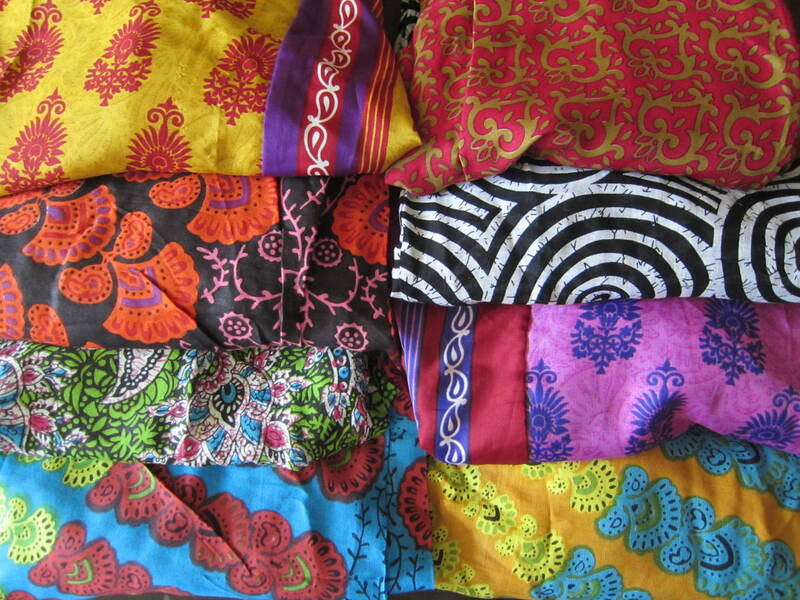 We visited a wonderful shop, Krishna Textiles, that I would highly recommend going to (located at Opp. Golimer Sadan, Near Hotel Glitz, Sitaram Puri, Amer Road). I am only sharing this place based on my personal experience, not because I was asked to. I really appreciated the owner, Manu and how he treated us when we visited. There is no pressure at all to buy. You can browse at the massive variety of items they have from bedding to pajamas to silk scarves to bags to tunics, without being bothered or hassled. They eliminate haggling by providing you a reasonable price at the start. 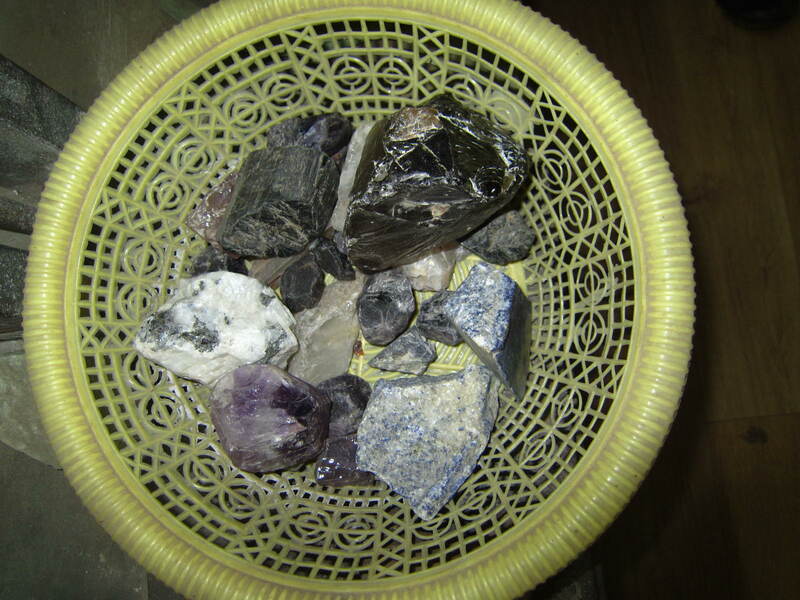 If you are interested in something in particular, they will assist you and show you a variety of options until find you what you are looking for. 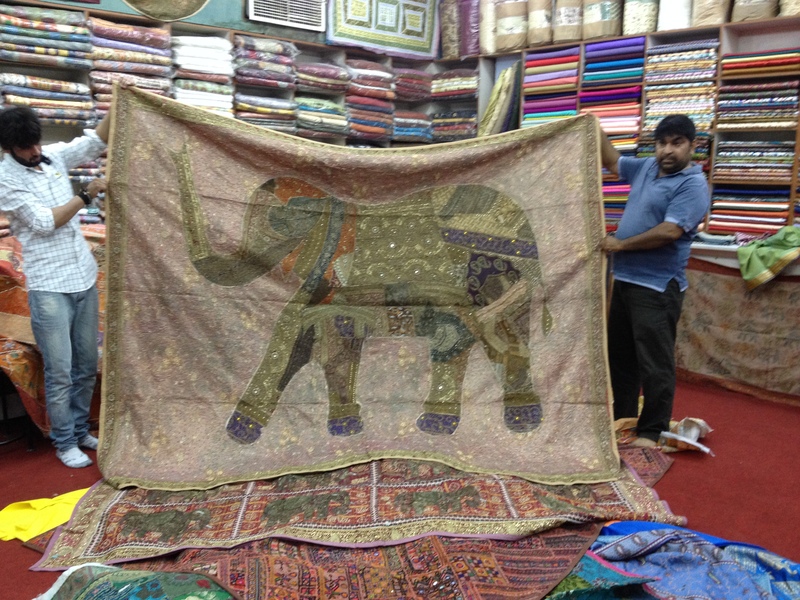 You can also view the block printing technique being done by hand, in their studio in front of the shop. 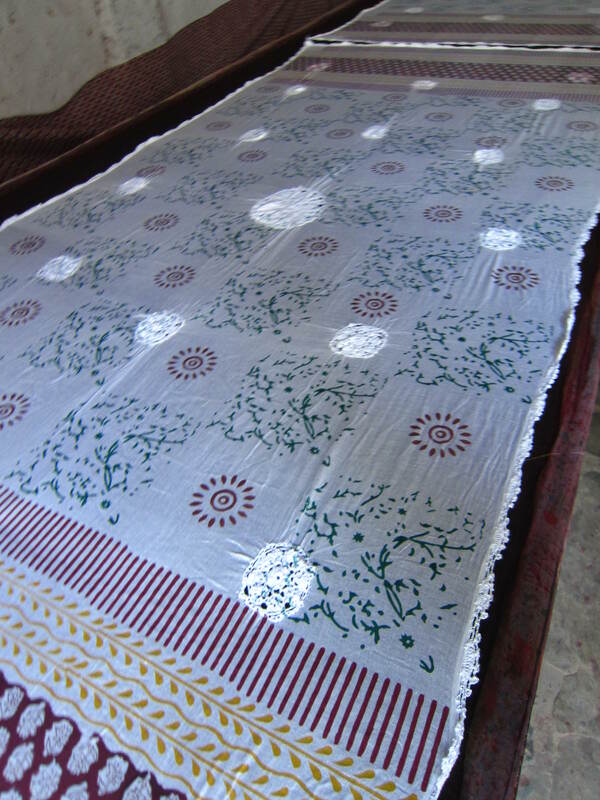 This technique uses vegetable and natural dyes, hand stamped with wooden block stamps, in a layered pattern on cotton or silk. You can purchase items displaying this technique in the shop as well as bolts of fabric if you want to make something with it when you get home. 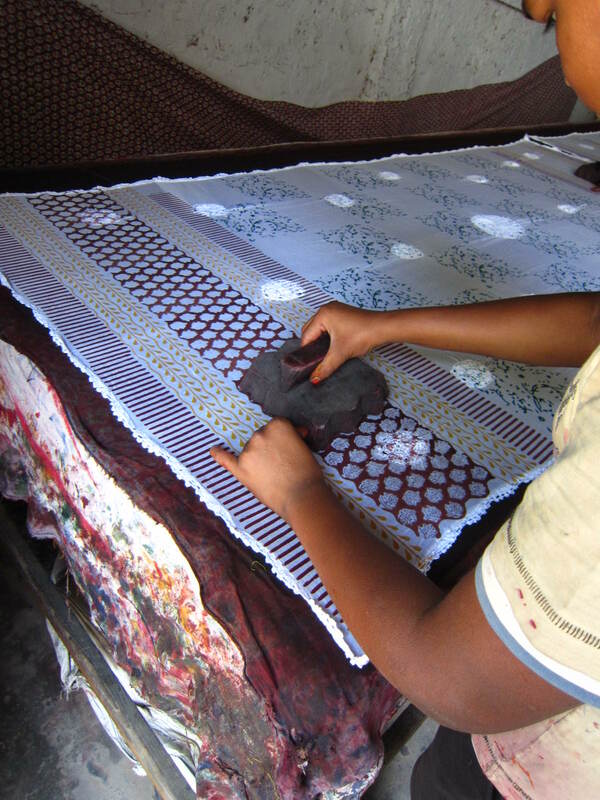 Each pattern on the textile uses a different stamp, applied in a layered pattern. This finished piece could be a table covering or scarf. Jaipur is also known for “Blue Pottery”, bold white and cobalt blue handcrafted dishes, tableware and accessories. I did not get to visit one of the shops selling the blue pottery but it gives me something new to check out when I return. 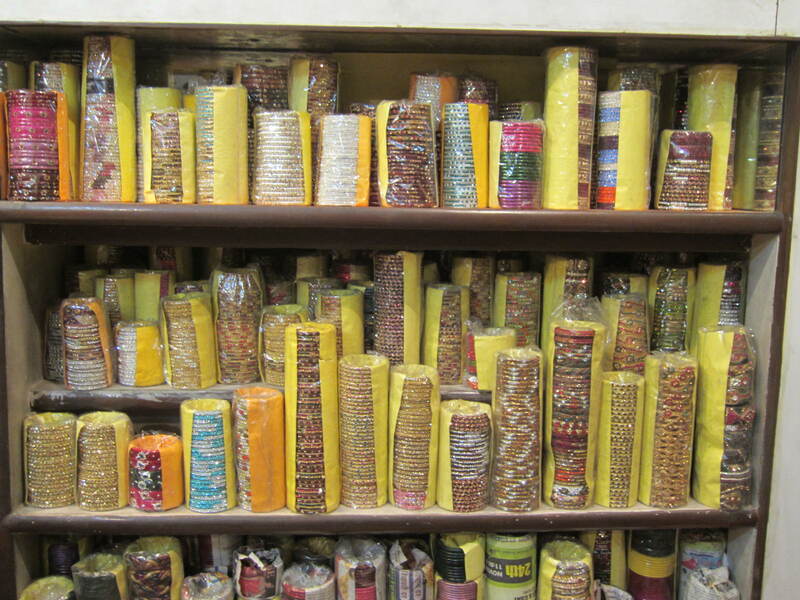 Jaipur is one of the best cities to get your shop on! If you get the chance to visit, I would love to know what treasures you find! This is what shopping delirium looks like. 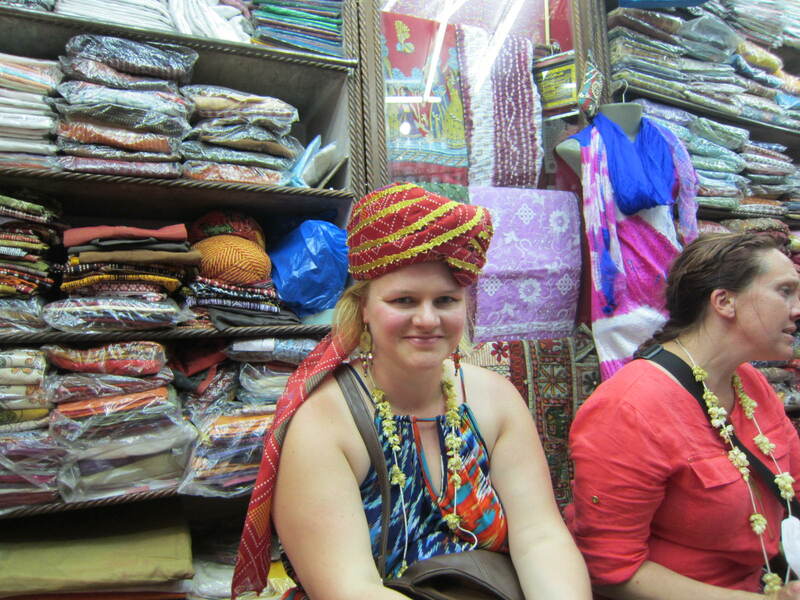 I was checked out, chillin’ (why, yes, I’ll wear that turban) while my friend was still fiercely bargaining! Definitely get henna done in the city. I got both hands, front and back done for around $14, in about 15 minutes. 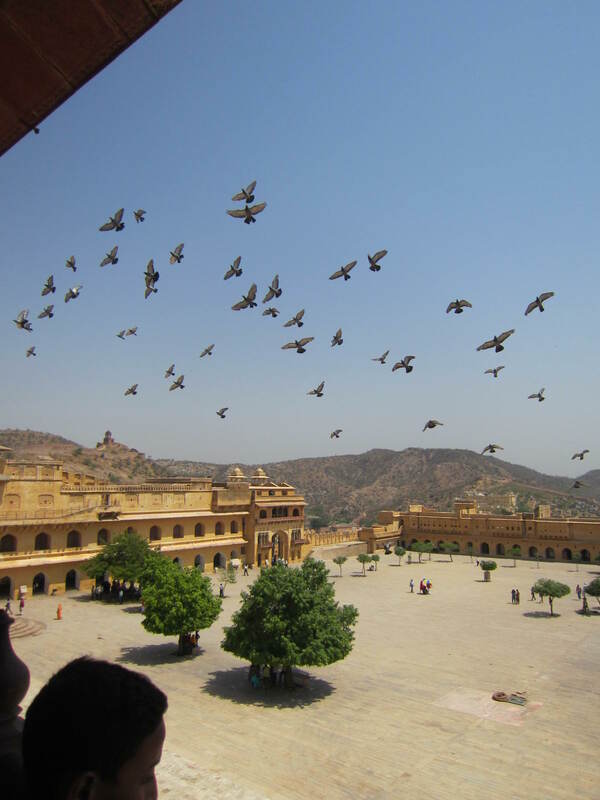 Make sure you visit the Amber Fort. The mirrored Winter Palace is breathtaking. There are many forts in India and this is one of my favorites. Grab a samosa at L&B, the oldest snack shop in Jaipur, in business for the last few hundred years. 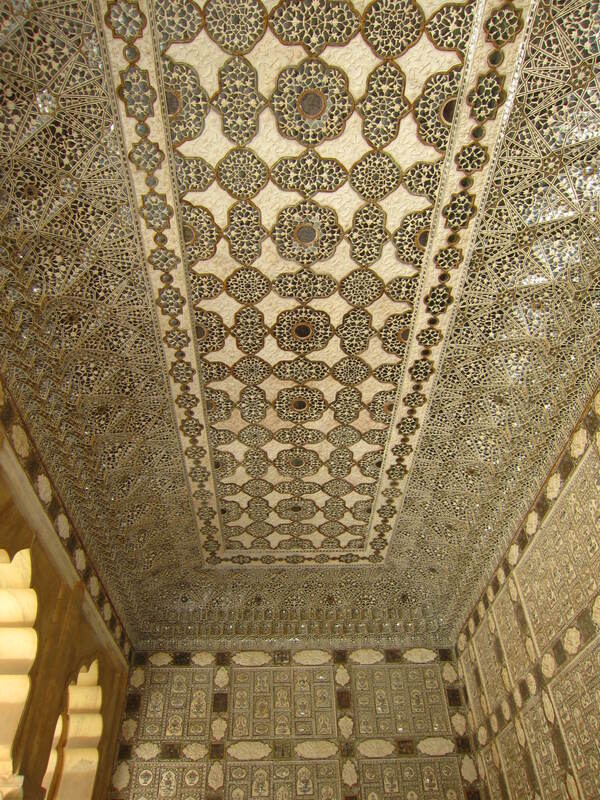 The ceiling of the Winter Palace at Amber Fort. The light of one candle would reflect in all the mirrors, replicating a starry sky. Everything looks amazing in Jaipur! The colors, it all captures the beauty of this part of India. I particularily love the block printing, that would be fun to try sometime too. It also seems a little overwhelming with all the choices. And I can’t believe they did all of that henna in 15 minutes, what pros!!!!! I just love Jaipur so much. It can definitely be overwhelming, as can most cities in India but it’s a treasure trove! Glad this inspired you in some way! 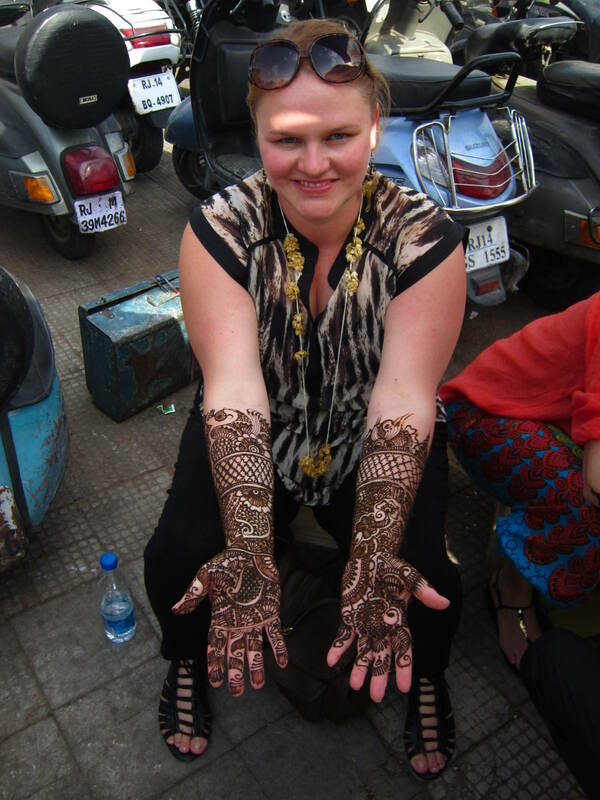 I love India and I highly recommend visiting. Your henna looks sooo dope! They rocked that henna! I loved having it and even did it all over my feet too.